More than 5 million Americans are currently living with Alzheimer's disease or a related form of dementia. By the year 2030, experts estimate that as many as 66 million people around the world will be faced with this life-altering disease. Unfortunately, these staggering statistics impact millions of caregivers, too. Compared with all types of caregivers, those who assist someone with dementia experience the highest levels of burnout, depression, poor health, and premature death. 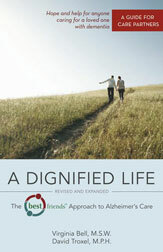 A Dignified Life, Revised and Expanded offers hope and help with a proven approach. Ten years ago, the first edition of A Dignified Life changed the way the caregiving community approached Alzheimer's disease by showing caregivers how to act as a Best Friend to the person, finding positive ways to interact even as mental abilities declined. Firmly grounded in the latest knowledge about the progression and treatment of dementia, this expanded edition offers a wealth of immediately usable tips and new problem-solving advice. It incorporates practical ideas for therapeutic activities—including the latest brain-fitness exercises—stimulate the brain while adding structure, meaning, and context to daily routines. With new stories and examples as well as an updated resources section, A Dignified Life, Revised and Expanded gives caregivers the support and advice they need to be successful and inspired in their demanding roles. While medical treatment of the disease hasn't changed in the past ten years, our understanding and awareness of treating people in a more caring way has changed substantially. With no cure on the immediate horizon, respectful care by effective and compassionate care partners is the only real "treatment" available to people with dementia. The Best Friends™ Approach is successful because it sustains people's connection to their world, their loved ones, and themselves. It's a universal program which has been embraced by professional and family caregivers throughout the United States, Europe, Asia, the Middle East, and South America. In its revised form, A Dignified Life offers caregivers an antidote to the burnout and frustration that often accompanies the role of caring for a person with Alzheimer's and dementia. Rather than struggling through a series of frustrations and failures, A Dignified Life shows the new generation care partners how to bring dignity, meaning, and peace of mind to the lives of both those who have Alzheimer's and dementia and those who care for them. What is it like to have Alzheimer's disease and other dementia? What would it be like to be unsure of your surroundings, to have difficulty communicating, to not recognize a once-familiar face, or to be unable to do things you have always enjoyed? When you understand the world of people with dementia, you can begin to understand their experiences, develop empathy, and relate better to their situations. The experience of Alzheimer's disease and other dementia can be like taking a trip to a foreign country where you don't speak the language. Customs are different. Deciphering a restaurant menu proves difficult; you may think you are ordering soup and end up with fish! When paying a restaurant bill with unfamiliar currency you might fear that you are being shortchanged, cheated. Tasks so easy at home are major challenges in an unfamiliar setting and can be exhausting. The person with dementia is in a foreign land all the time, as seen in Irene Hong's postcard. Rural Taiwan is lush and green but I'm staying in the noisy city of Taipei in my grandmother's place who is 80 and sharp as a nail. One thing that might interest you is that when my Mom first came back to Taiwan after a 20 year absence, she was so disoriented that she surmised this might be what the initial stages of Alzheimer's is like. She couldn't find the right words in Taiwanese (her native language) and she'd forgotten some of the customs though everybody expected her to know her way around her 'home' country. She felt so frustrated. It is true that Alzheimer's disease is like traveling in a foreign country, isn't it? Rebecca knew that she was losing her language skills and the ability to communicate her wishes. Her writing reveals that her once-meticulous grammar was slipping. Complexity became her enemy; she could not follow the din and roar of competing conversations—calling it 'noise.' Her statement about social workers, nurses, and friends who do not treat her as a 'real person' still makes us both smile and wince. Even though her cognitive skills were in decline, she recognized that people were treating her differently. -Consequently, she expressed her anger and some resentment toward these people. Remarkably, she was trying to create a plan for the future. Her notes indicate that she was deciding to take things 'one day at a time' even if it was a struggle. Reading these heartfelt words, you too can begin to understand the experience of Alzheimer's disease and other dementia. Without understanding this world, we cannot possibly develop successful strategies for improving the lives of our friends or loved ones with dementia. Every person's response to Alzheimer's disease or other dementia is different, but many people will experience one or more of the following emotions. We all worry or become anxious at times. Parents worry and become anxious about their teenager who is not home by curfew. Families may worry about having enough money to pay all of their bills at the end of the month. Some people worry that a favorite celebrity's marriage is in trouble after reading the latest tabloid at the supermarket. The person with dementia can become consumed by worry and anxiety. One frequent by-product of dementia is that the person cannot separate a small worry from an all-consuming concern. For example, a person with dementia may begin worrying about dark clouds in the sky seen through a window. Left unchecked, the worry can grow and wreck his or her afternoon. A spring shower could turn into a thunderstorm! Harry Nelson was a practicing dentist when he was diagnosed with Alzheimer's disease in his mid-fifties. He was very anxious about his life and the lives of his family. He worried, when in spite of his determination to keep fit mentally, spiritually, and physically, his scores on his mental exam kept going down. He worried that he would not be able to go hiking with his grandson when he became old enough to enjoy a sport that he loved. His dreams and aspirations were on hold, and he had difficulty not being anxious about the future. Virginia Bell, MSW, is Program Consultant for the Greater Kentucky/Southern Indiana Chapter of the Alzheimer's Association at the age of 90. She is a pioneer in the dementia care field, having founded one of the first dementia-specific adult day programs, the award-winning Helping Hand Adult Day Center, which for more than twenty-five years has been a model for other programs nationally. She has published numerous journal articles and book chapters and has co-authored five books with David Troxel. Bell has been recognized at the regional, state, and national levels for her leadership and good works, including prestigious awards from the American Society on Aging, her state of Kentucky, and the national Alzheimer's Association. She has lectured about the Best Friends™ approach in more than twenty-five countries, including the last twenty Alzheimer's Disease International conferences. David Troxel, MPH, is a consultant on dementia care, staff development, and training for the long-term care industry. He served for a decade as President and CEO of the California Central Coast Alzheimer's Association (1994–2004) and was previously Executive Director for the Lexington/Bluegrass Chapter (KY) of the Alzheimer's Association. He sat on the Executive Board of the American Public Health Association as well as the Ethics Advisory Panel of the national Alzheimer's Association. He also has first-hand experience as a caregiver to his mother, Dorothy, during her ten-year journey through Alzheimer's disease. Troxel is in high demand as a speaker for regional and national events and is known worldwide for his writing and teaching.